Thanks to Steve Morton for this guest blog post on the BBC’s CEEFAX service, now in its death throes with the final roll-out of digital tv and the “Red Button”. Steve’s career was as an RF engineer with various Government departments. Nowadays he blogs about life here in France and has a keen interest in new technology as well as the old tech Filofax. It's a sad day when it was announced that the main TV transmitter in the South East of England shut down its analogue service and went digital only. Now I'm not against digital transmission, far from it. But along with the killing off of the analogue TV service saw the last of the Ceefax teletext service that first came on air back in 1974. It reminds you how old you are when you see a technology come in and go out nearly 40 years later! For all its faults Ceefax has one big advantage over the internet, which is infinite bandwidth in terms of the number of customers it can serve at any one time. Being a broadcast only service it doesn't suffer from overload when lots of users are looking for information at the same time. We are all so used to turning on our PC's and calling up say a travel news website to see what the current road conditions are etc. However think back to the bad winters recently when the trains have all ground to a halt due to a few inches of snow and you will soon see where Ceefax could still have a purpose. During these periods of bad weather the common complaint from train passengers is 'we couldn't find out any information' or 'the website crashed'. With Ceefax there is no such problem, it just kept pumping out the information pages as required, the receiver filtered the pages to show just the information you wanted. As long as someone in an office or control centre somewhere could up-date the information everyone with a Ceefax receiver would have up to date information. Going back to the 1980's some of you might remember the BBC B microcomputer, there was a teletext add-on for this machine, in a way it was a form of internet connection although you couldn't send data or emails only receive information. 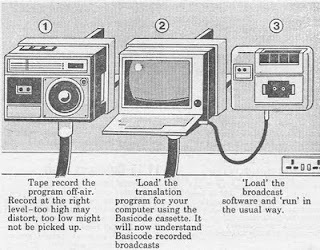 The technology for a teletext decoder is so tried and tested and as cheap as chips these days that it could be easily be built into a tablet computer as a receive terminal for times when you just need to receive information not transmit it. This’d most probably be a function that could be designed in software. 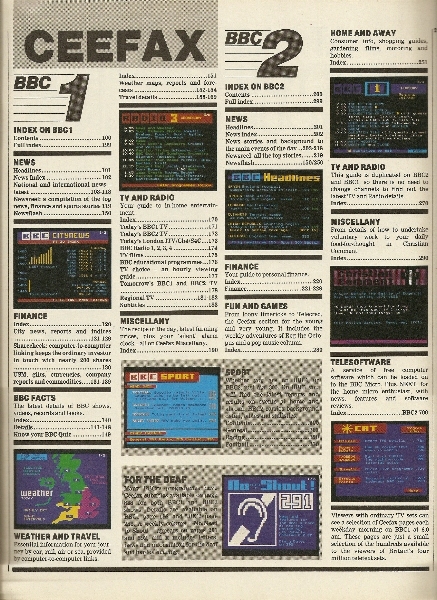 Now you might say that's ok, but Ceefax is a bit 'blocky' and low res, yes but there were other higher res versions of the specification that were agreed but never fully implemented. Maybe the new 'Digital Teletext' as used on the Digital TV systems might find its way in to tablets and mobile phones in the future for my 'receive only data service' which for a lot of people just wanting a news up date or travel up date will be more than enough... and cheap too. Jon Curle, former BBC announcer and presenter, died earlier this month aged 83. 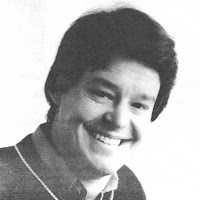 Jon was one of the team of Radio 3 continuity announcers in the 1970s and 80s but had been with the BBC since 1959 working mainly on the Light Programme. If you catch any repeats of the comedy shows The Men from the Ministry or Whack-O, chances are its Jon’s voice you’ll hear doing the opening and closing announcements. But it’s a connection with John Peel that has given rise to an interest in Jon’s career. 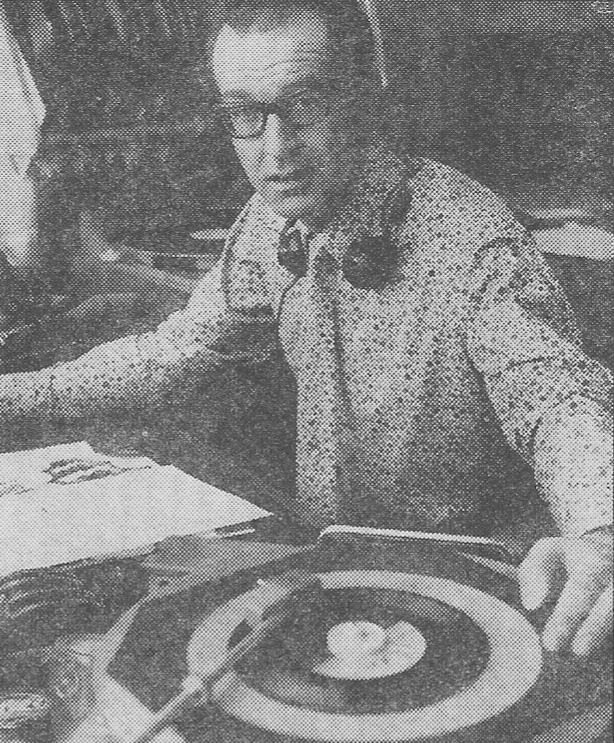 As the Peel Wiki site explains Curle “became presenter of the second half of the Wednesday Night Ride in 1968, immediately following Peel's midnight to 1 a.m. programme, and showed himself to be more sympathetic than any of his Radio Two colleagues to what was a radical departure from the regular BBC late-night easy-listening format. He allowed Peel's show to influence his own choice of material and sometimes played session tracks when Peel did not have enough time for them in the first hour of the Wednesday Night Ride”. This arrangement was short-lived as by April 1969 Jon Curle was hosting the full two hours of Night Ride, then still classed as a Radio 1 programme. 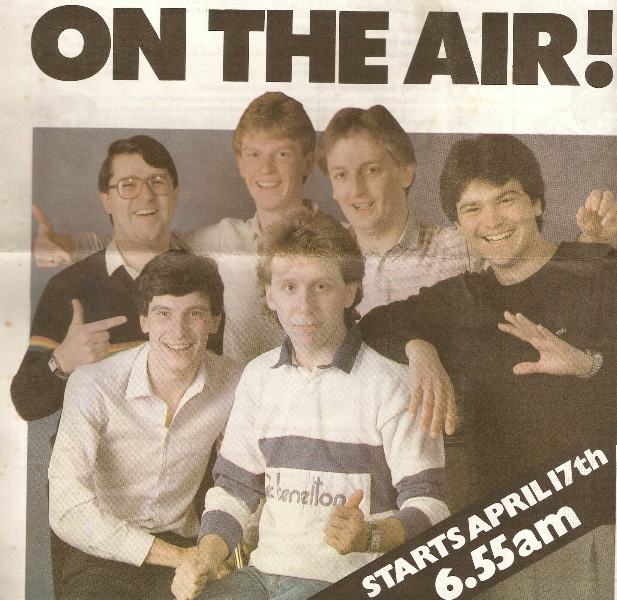 A year later it was billed as a Radio 2 show, again transmitted on both networks. The Radio Times of 25 March 1971 carried an article on Jon titled Curle up and relax. Time was when Jon Curle’s main function of the week was to fill in the hole left by John Pell in the early hours of every Thursday morning, right after Peel’s Night Ride had been faded out to make way for the one o’clock news. At first Curle had been apprehensive about stepping in; he felt he had very little in common with peel and that the continuity they were working for would be lost. Of course, he was wrong. They met, liked each other and, within weeks, the change-over halfway through Night Ride became keenly anticipated. He started off as an actor (“repertory, a few television plays, nothing startling”) and has been a staff announcer with the BBC for about 12 years. He’s in his middle forties, an immaculate dresser with an easy, sophisticated style; musically his tastes range through Beethoven, Mozart and the Mothers of Invention to Simon and Garfunkel and Peggy Lee. He’s a film fanatic – though cineaste is how he’d prefer to put it – and spends most of his off-duty hours at the pictures or weeding the garden as his Blackheath home. Wednesday nights have become a bit of an occasion; the studio lights are dimmed, the curtains are drawn and wine and cigars are there to be shared by whoever drops in. All very relaxed, just how it sounds. Here’s a clip of John Peel’s show from 28 May 1969 with Jon Curle popping into the studio to plug his show. I’ve posted these clips before but this is Jon in action in The Men from the Ministry, opening up Radio 3 and helping listeners through the 1978 wavelength changes. Jon grew up in Gravesend, Kent. After his two year’s National Service his parents decided he should take up a career in teaching. “I dropped out of school to join the local repertory company at £1 per week. Acting, scene painting, prompting, handling light cues, often wrongly. One actress in a production reached out to switch on a standard lamp and I plunged the stage into gloom”. Other early jobs were as a waiter and a packer for a book club. Jon’s first broadcast, whilst as a drama student, was in an Arthur Swinson feature on the Northern Home Service. His announcing career started in 1959 when Peter Fettes, the BBC’s Head of Staff Training, had the idea of inviting a handful of radio actors to train as summer relief announcers. 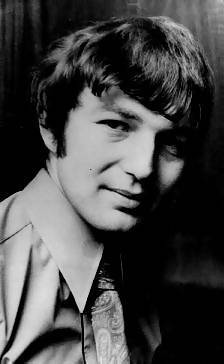 During the 1960s Jon was a newsreader and continuity announcer across all the networks and was regularly heard on many Light Programme music shows including Morning Music, Breakfast Special, Friday Night is Music Night, Music Before Midnight, It’s One O’Clock and Playtime. Come 1967 he was one of the hosts of Night Ride. By 1972 he’d joined the Radio 3 announcing team where he remained for the next two decades. This is one of Jon's favourite pieces of music - Bizet's Symphony in C - whenever Radio 3's programmes had an underrun this is one of the tracks that he used to reach for. Colleagues described him as “a very dear man… the consummate professional announcer” and as a “wonderful erudite gentleman”. 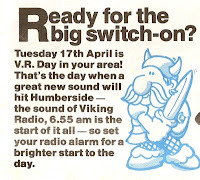 Viking Radio’s launch date was set for Tuesday 17 April 1984. First on air would be ‘ageing groover’ Dave Fewster. Dave had started his broadcasting career in hospital radio in Warrington before moving to Red Rose Radio and Marcher Sound. 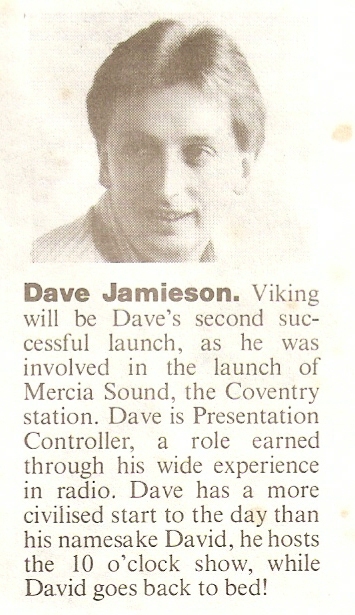 When Viking Radio beckoned Dave became a regular DJ in the area later appearing on Radio Humberside, KCFM and community station WHCR. Alongside this Dave found time to establish and later sell Chem-Dry UK up on Swinemoor Lane in Beverley. 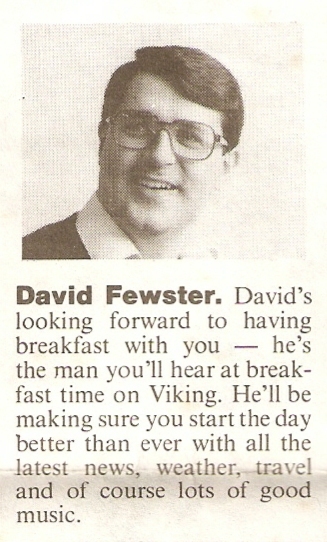 Here’s Dave Fewster and Steve King enjoying some banter in 1987 (apologies for the odd buzzing sound). Following Dave was, er Dave. Jamieson this time, with Notice Board. Dave’s radio career runs as follows: hospital radio in Edinburgh, guest DJ on Radio 1 Club, Radio Leicester, BRMB, BBC Scotland, Radio Clyde, Mercia Sound, Viking Radio, Radio Tees, Central TV, then on a freelance basis back to BRMB, Xtra AM, Heart FM and now enjoying life in Spain working on Coastline FM. Here’s part of Notice Board on Day 1. Towards the end listen out for Dave getting somewhat exasperated trying to contact Beverley, Australia. 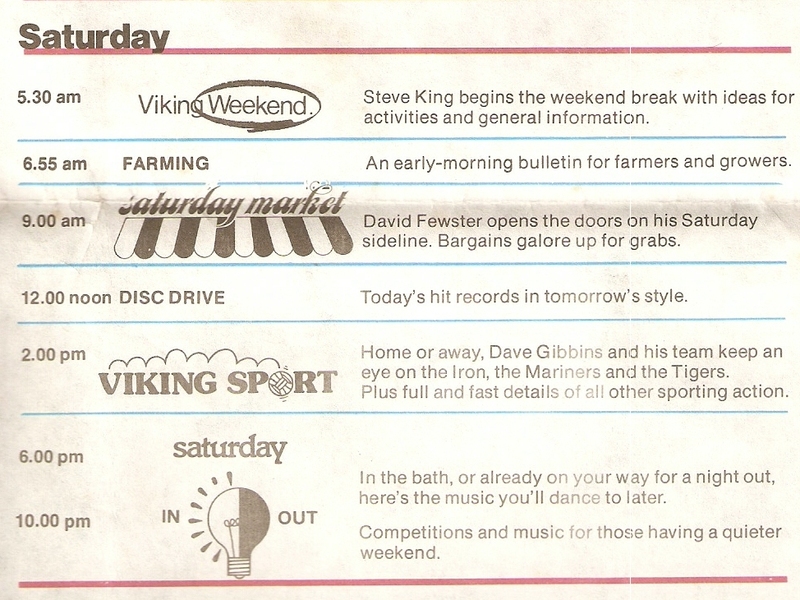 Inviting listeners to a Packed Lunch was Steve King. 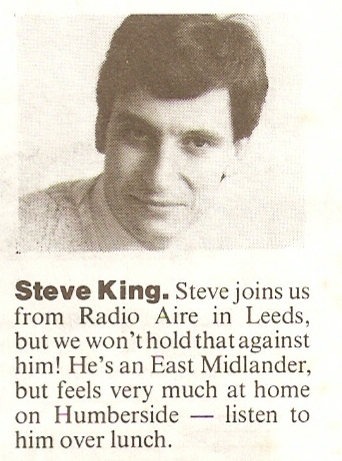 Steve was at Radio Aire over in Leeds before moving to Hull. He rose through the management ranks at Viking, Hallam, Aire, Metro Radio Group and Forever Broadcasting. Now at EMAP Steve is the Programme Director for their network. In the afternoon it was Checkout with Mark Allen. 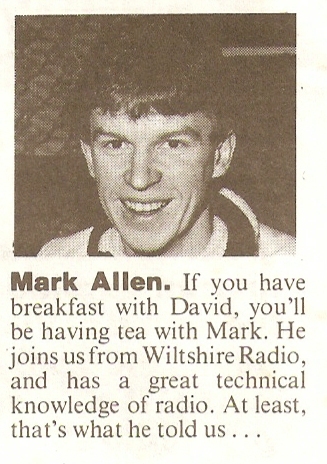 Mark had previously been as Wiltshire Radio and later may have moved to Australia. In this clip listen out too for news reporter Hugh Pym, later to work for ITN, Sky and now Chief Economics correspondent for the BBC. 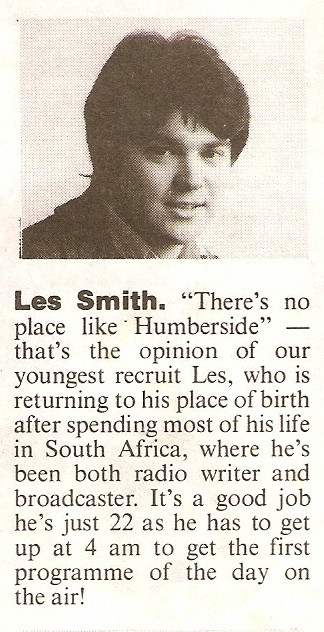 Opening up the day, from the Wednesday, on Daybreak was Les Smith. 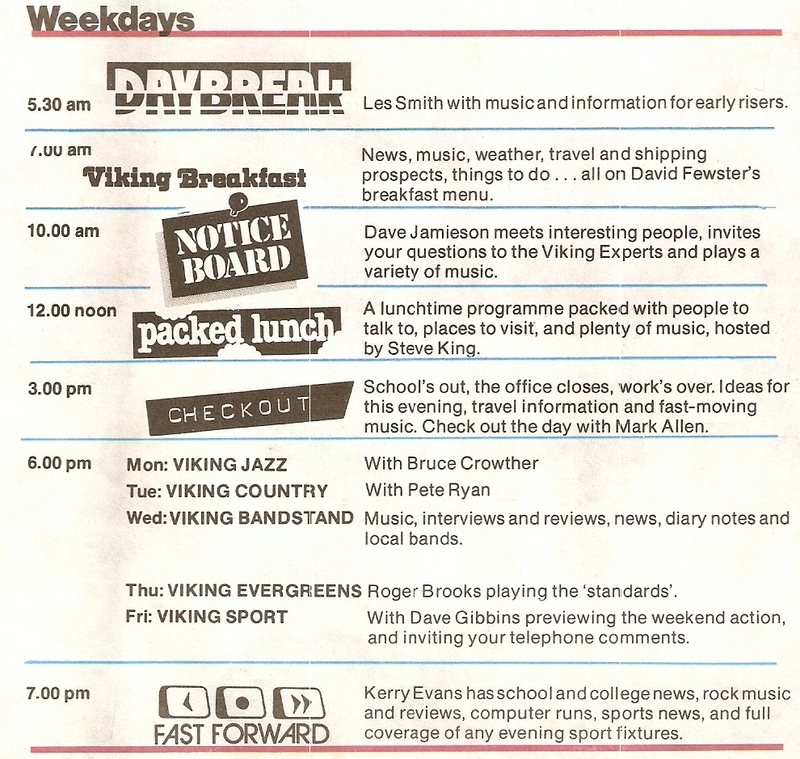 Les had started in radio in South Africa before returning home and joining Viking. Subsequently he would appear on the Yorkshire Radio Network and Compass Radio. 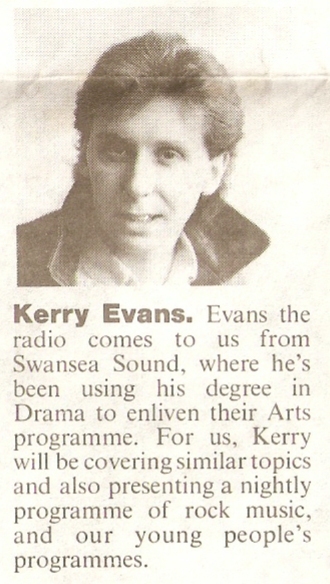 Closing the day with Fast Forward, as well as hosting the cleverly titled North and South Bank Show on Sunday evening, was ex-Swansea Sound DJ Kerry Evans. In this clip you’ll notice that Dave Golley was working both ends of the day as he was reporting from Boothferry Park. And there’s a soothing goodnight jingle to close the first day’s proceedings. Those early schedules promised much more than pop music of course. ILR stations were still trying to be “all things to all people” and providing programmes that would serve a wide cross-section of the audience. 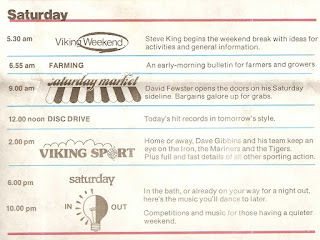 So we had farming programmes, local business topics and music for jazz, country and brass band aficionados. Inevitably there was a bit of poaching from the local BBC competition. The Presentation Department secretary came from Radio Humberside and she in turn acted as go-between in negotiating to bring sports presenter Dave Gibbins (below) onto the team. Also there at launch was Steve Colman, though mysteriously missing from the publicity and schedules. Steve’s first show was on Friday night at 10 p.m., with Night Light. Steve went on to work at Metro and Magic 1152. The final ingredient in the on-air mix were the jingles, those wonderful full orchestral over-the-top jingles. Several production companies were approached to produce Viking first jingle package before the commission went to Cath Baxter. The bonus here was that Cath Baxter was based locally at Cawood near Selby, though the jingles were recorded over at the Strawberry Studios in Stockport. On vocal duties were Steve Butler and Sheila Scott, both seasoned jingle singers with Alfasound. The package offered about 100 jingles, with all the various alternative mixes. These instrumental versions of the main image song and the sports theme let you appreciate the work of arranger Paul Flush. You can see where Chris Moyles and the guys at Music4 got their ideas from can’t you? So here’s Viking’s launch from that Tuesday morning just before 7 a.m.
MD Roger Brooks provides the opening announcement before the Viking song. The first adverts are for the TSB, Comet, North Country Breweries, Humberside Property & Motor Guide and Paul Dixon Motors. 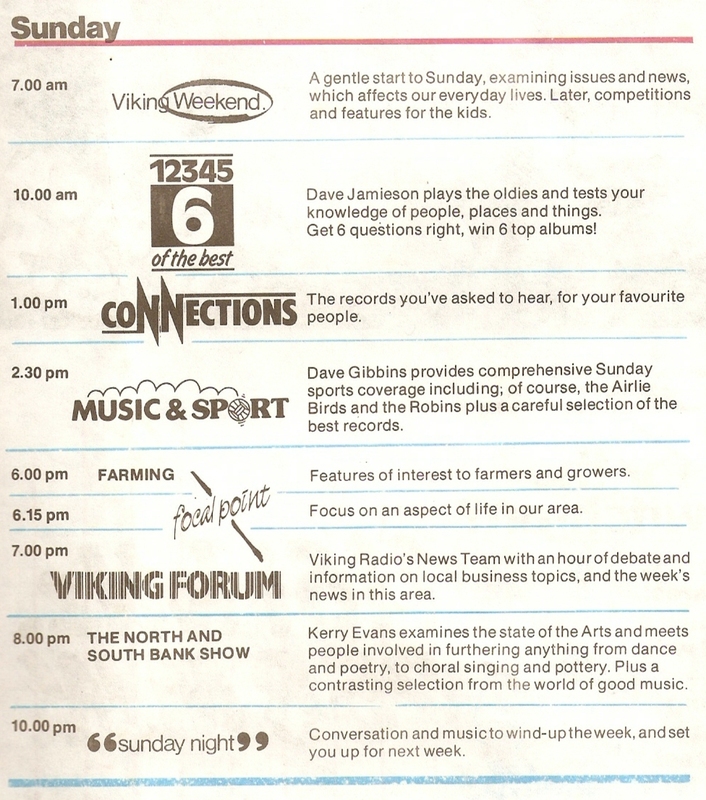 The news is read by David Golley and certainly demonstrates Viking’s commitment to news - the first record, Kool and the Gang’s Celebration, doesn’t kick in until 12 minutes past 7! Dave Fewster then cues in It’s a Miracle by Culture Club. 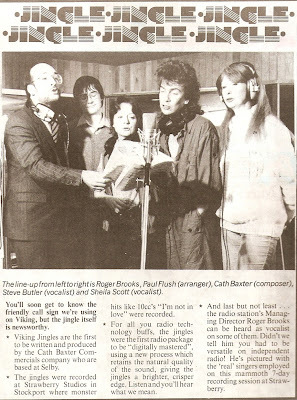 An advertisement feature published in the Hull Daily Mail the day before the launch gave more details about the news team which was headed by Colin Palmer who had spent the previous ten years at BRMB. The team of journalists were David Golley from Wiltshire Radio, Mike O’Neill and Richard Ventre had both been on local papers, Hugh Pym ex. BBC Radio Oxford and Simon Garrett from BRMB. 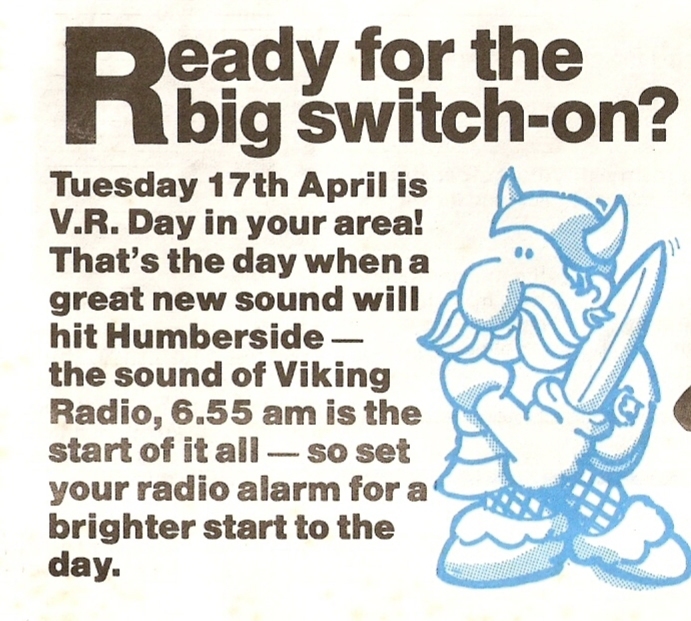 As well as FM and AM Viking could be heard in Hull on Channel D of the cable system operated by Rediffusion and on the Radio Line by dialling 211258 – yes remember that, radio over the telephone in the days when Hull Telephones offered unlimited local calls for about 5p. Coming up: network splits, country wars and Viking goes gold. Thanks to Dave Jamieson and Paul Bromley for their assistance with this post. Do you remember those radio shows where you could phone in and request any record you liked, a member of staff would then go scurrying round the record library to find it and when the DJ had finished his fill-in chat it would, hopefully, it’d be spinning on the turntable. 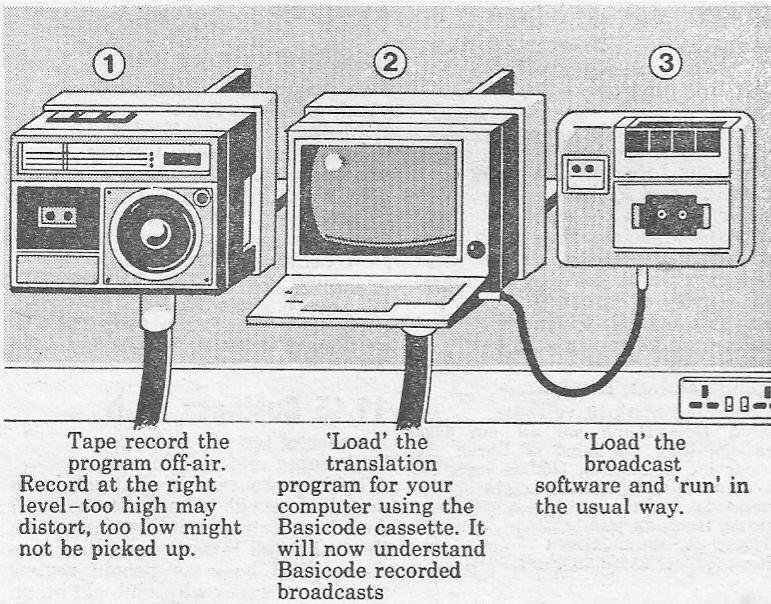 Ah, for the days before computerised playout systems! Now I’m pretty sure that such a programme went out on BBC Radio 1 in the 1980s. Was it just on a Friday? Mike Read or Peter Powell, or someone else? I’ve been racking my brains over this so any answers would be jolly welcome. As it turns out the notion of challenging the BBC Gramophone Library to find a disc goes back about 50 years. During the 1960s the BBC would often broadcast from the Daily Mail Ideal Home Exhibition at Olympia and one such show was Exhibition Choice, going out in the Twelve O’Clock Spin slot. In the programme the DJ, Keith Fordyce or in this case Geoffrey Wheeler (of Top of the Form and Winner Takes All fame but who did a stack of radio in the 60s/70s), would talk to visitors who’d then ask for their record choice. The theme for Exhibition Choice was Polka for Strings by Dolf van der Linden and his Orchestra. Earlier this evening Colin Berry, on BBC Radio Three Counties, recalled this programme and played the theme. (BBC Local Radio online still suffers from the odd popping sound). Picture three guys (let’s not call them old men but they are in their 60s and 70s) down the pub chewing the fat and reminiscing about the “good old days”. But these chaps are not just anyone, they broke the law, they were pirates and they were pioneers of pop. OK, the pub is a studio but Pirates on Parade, on BBC Radio Norfolk this Easter weekend, allows us to eavesdrop on a conversation between Keith Skues, Andy Archer and Tom Edwards, all offshore pirates in the swinging sixties. Of course these guys love to talk about that time anyway, try stopping them! But the programme does give a clear sense of what life was like on the ships and forts that beamed out Radios Caroline, City and London, which the three DJs worked on. It wasn’t as glamorous as The Boat that Rocked the World might have you believe: in between shows life seemed to consist of grabbing what sleep you could, “enjoying” the somewhat unconventional cuisine of the Dutch crews (everything seemed to be covered in nutmeg) and watching Anglia TV. In Pirates on Parade you’ll hear how Andy Archer was refused a job because he was wearing the wrong shirt; how, as a Pontins Bluecoat, Tom Edwards got his first taste for broadcasting by playing records over the tannoy; and when Keith Skues took shore leave, and sensing the era of the pirates was at an end, he’d smarten himself up and sit in the public gallery of the House of Commons to watch the Marines Offences Bill go through. 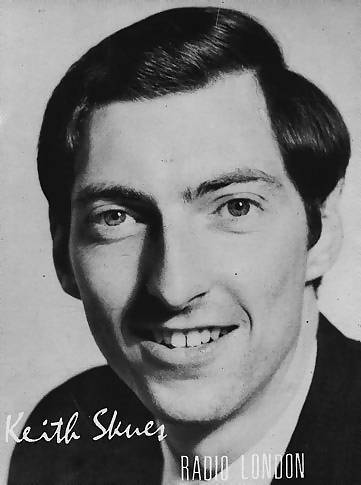 Keith Skues was a DJ at both Caroline and London before heading off to Broadcasting House and joining the new line-up on Radio 1; he presented the second show on the network on that opening day. You can still hear Keith every Sunday evening on Radio Norfolk. Read more about Keith in this post – Radio Hallam. Andy Archer became the real pirate, staying on-air at Caroline after the Marine Offences Act came into force and was the first person to be prosecuted and fined under the legislation. Read more about Andy in this post – Radio Orwell. 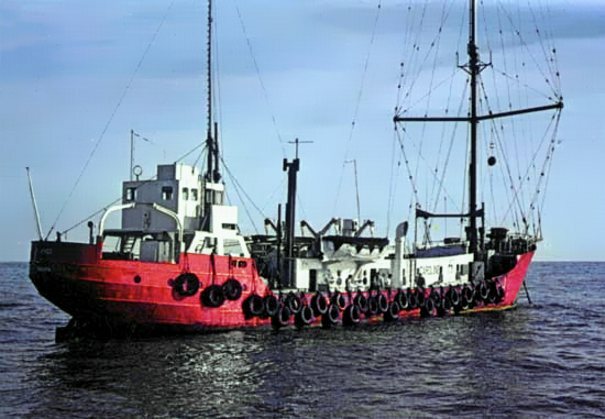 Norwich lad born and bred Tom Edwards was at Radio City, he closed down the station in February 1967, before moving to Radio Caroline South. Back on terra firma he started a career in TV working on BBC Look East, he would later become an ITV announcer, but got back into radio when, in January 1968, he was asked to join Radio 1’s Midday Spin when Simon Dee left the station. Read more about Tom in these posts – Good Morning Great Britain and Wake Up Easy. Pirates on Parade is a 2-part programme produced by David Clayton and Paul Hayes and can be heard on BBC Radio Norfolk 1200-1300 Sunday 8 April 2012 and 1300-1400 Monday 9 April 2012. It is also on BBC Radio Lincolnshire 1200-1300 Friday 6 April 2012 and 1200-1300 Monday 9 April 2012. Thirty years ago this week events rapidly unfolded in a part of the world that at the time few people knew existed – the Falkland Islands. With the issue of sovereignty back in the news in this post I recall the events of 1982. I’ve retrieved these short audio clips of news bulletins of the time which hopefully will be of interest to any historians. If nothing else, from a broadcasting point of view, they are a reminder of former BBC newsreaders and reporters and also confirm just how long Peter Donaldson has been on Radio 4. 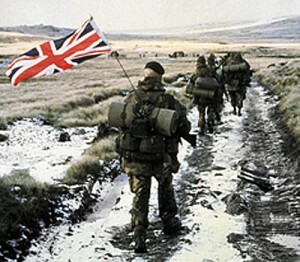 Argentine forces capture the Falkland Islands. Radio 1 news read by John Andrew. Political fallout as Lord Carrington resigns. Radio 4 news read by Peter Donaldson. British attack on Argentine submarine (later confirmed as the Santa Fe). Radio 2 news read by Gavin Campbell with reports from the BBC’s defence correspondent Christopher Lee. British Marine recapture South Georgia. Radio 4 news ready by Peter Donaldson with chief political correspondent Brian Curtois, defence correspondent Christopher Lee and Tony Benn MP. British attack the Argentine held airfield at Port Stanley. The World at One with Gordon Clough, Christopher Lee and Paul Reynolds. The Battle for Goose Green had taken place a few days earlier but this report from Robert Fox was broadcast on Radio 4 on 2 June. Pooling arrangements for reporting on the conflict led to this report on Radio 4’s PM programme by IRN correspondent Kim Sabido on the ceasefire a couple of days earlier. Do you fancy some free software? In Basicode? 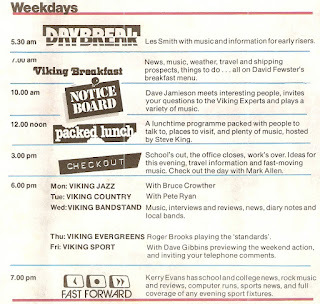 The programme also offered a takeaway service on VHF four nights a week at 00:33 whilst the shipping forecast was going out on long wave. “They’ll sound like a series of harsh beeps”, said the RT, “but after they’ve been taped and fed into computers they’ll turn into games and informational software”. 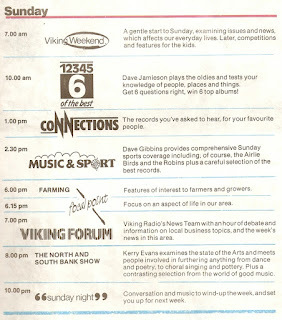 Here’s a programme from the early hours of 22 January 1984. Apologies for the recording quality, it sounds like someone is frying chips in the background. Tape recorders at the ready!